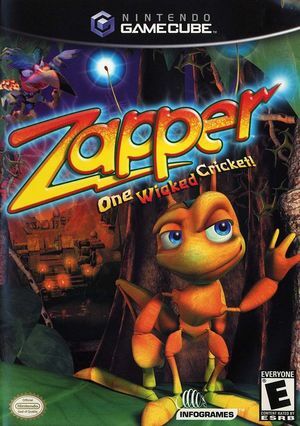 In Zapper: One Wicked Cricket, you play a small creature that embarks on a great quest. Zapper is a cricket in search of brother Zipper, who was kidnapped by the evil Maggie the Magpie. Through 18 twisted levels, you'll evade bizarre enemies and deadly hazards using your electrified antennae and springy reflexes. Zap your foes, explore your surroundings, and find and destroy eggs before they hatch. Zapper's intense action continues as you unlock hidden areas, bonus levels, and play multiplayer games. The graph below charts the compatibility with Zapper: One Wicked Cricket since Dolphin's 2.0 release, listing revisions only where a compatibility change occurred. This page was last edited on 1 March 2018, at 06:17.